Last week we highlighted for you a beautiful Tree of Languages infographic, created by Minna Sundberg using data from ethnologue.com. This week, we present another visualization of world languages, this one produced by Alberto Lucas Lopéz, on behalf of the South China Morning Post. And, once again, the underlying data comes from ethnologue.com, a research project that catalogues all of the world’s known living languages. 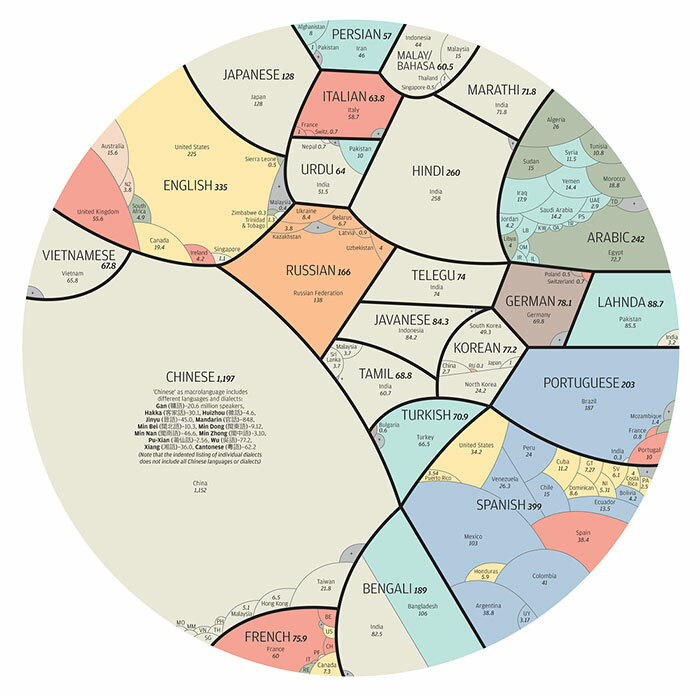 Today's graphic -- click here to view it in a large format -- takes the world's 23 most popular languages, and then gives you a visual sense of how many people actually speak those languages overall, and where geographically those languages are spoken. The more a language is spoken, the more space it gets in the visual. When you view the original graphic, you'll note that Chinese speakers outnumber English speakers by a factor of four. And yet English is spoken in 110 countries, as compared to 33 for Chinese. And the number of people learning English worldwide dwarfs the number learning Mandarin. As you look through Lopéz's visual, you'll want to keep one thing in mind: Although the 23 languages visualized above are collectively spoken by 4.1 billion people, there are at least another 6700 known languages alive in the world today. Someone has to cook up a proportional visualization of those. Any takers? Speaking of learning popular languages, don't miss our collection: Learn 48 Languages Online for Free: Spanish, Chinese, English & More. Just a note, Angola (20 milliions) and East Timor, Cape Vert, São Tomé e Príncipe, Guiné, are all countries where Portuguese is the ofificial language. whole central asia speaks turkish yet it’s less frequent than italian? yes – where is french speaking Africa??? Totally inaccurate visual. There are over 80 million German speakers of German in Germany alone without counting Austria and Switzerland German speaking cantons. this obviously doesn’t cover all languages spoken in any particular country. If you travel to most countries around the world English is spoken to one degree or another. However, if you try apply the same throught with all other languages, this isn’t necessarily the case. so did several million inhabitants of Austria suddenly lose the ability to speak German? Looks like, as others have pointed out WRT Africa that a lot of data are missing or unreported. While entertaining, the diagram is not at all accurate. French is spoken by up to 300 million people. German is spoken by almost 100 million. This infographic is very misleading. Mexico is the wrong color. Malaysia should not be gray with a plus sign; that should be the smaller bubble with no country named. Sloppy, as also evidenced by many of the other comments. This was in the South China Morning Post?! 1) Where are the French-speaking African countries ? 2) Why isn’t UK (or at least England) into the english-speaking countries ? When you walk from Turkey to China, through Azerbajcan, Kırghzistan, Kazakhistan, Turkmenistan etc. even in the north of China what you speak is Turkish and its dialects. there is no way there are more german speakers in poland than in austria. there’s probably more german speakers in austria than in switzerland. were they counted as “bavarian” or something? Why are Hindi and Urdu listed separately but many Chinese languages combined? I have a hunch that there are greater differences within the Chinese group than between (spoken) Hindi and Urdu. Malayalam is missing here – spoken by around 40 million people. It looks like most of the complaints by comments are related to a confusion in what this map represents. This map is NOT which languages are spoken by people, but what language is the PRIMARY language spoken by someone. It is a re-occurring issue linguists have when showing language populations because many people speak several languages even on a daily basis. There are even more people who are fluent in several languages even if they don’t speak them regularly. It’s ‘Telugu’ not ‘Telegu’. Please consider acknowledging it, even if you can’t change it. Sloppy as other commentators already told. To start with, only in Germany are more than 80 million german natives, in Siwtzerland a 75% is german speaking by bnature, french jst a 23%, here it is exactly the other way around. Add to german the millions of Austrians etc and you get nearly 100 Million. If you do such an “info”graphic you should make public your soruces, where do you get these numbers from ? Check your sources (or do your homework) : 274 million francophones in the world.